Find the hidden whale in the latest Golden Bay Visitor Guide. Go to the place where the whale is hidden. Take a selfie at The Legend of Huriawa. At the same time answer this question: "Who is the protective guardian of this place?" This is the start of your Treasure Hunt. There are 3 Entry Forms A,B and C (so we could include all our participating members who have kindly donated prizes towards this competition). You can enter one or all of the Entry Forms, it is up to you. You can download Competition Entry Forms A, B and C on the links below to begin your Golden Bay Treasure Hunt or you can get hard copies from our Golden Bay Visitor Centre. Remember to have fun and enjoy - share with your family and friends a wonderful way to explore the lesser and well known places of Golden Bay. You can download Competition Entry Form A to begin your Golden Bay Treasure Hunt. 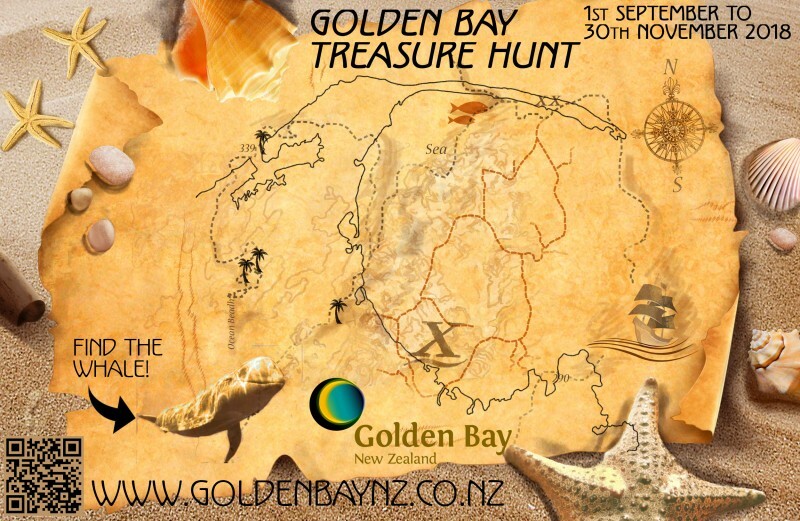 You can download Competition Entry Form B to begin your Golden Bay Treasure Hunt. You can download Competition Entry Form C to begin your Golden Bay Treasure Hunt.